What a strange journey it’s been. Some 13 years and seven albums. Born from the Trash Metal era, but always more – much more – than a Trash Metal band, French-Canadians Voivod have made some of the most satisfying and challenging extreme rock music of the modern era. Ever since their debut album, `War and Pain’, hit the streets in 1984, the `Vod have combined an intelligent, thoughtful approach with some of the most blitzing riffs known to humankind. Since then, seminal albums such as 1988’s `Dimension Hatross’, 1989’s `Nothingface’, `1991’s `Angel Rat’ and `1993’s `The Outer Limits’ have proven to be among the most influential of their kind. VOIVOD were exploring the concept of Cyberpunk and state-of-the-art artificial intelligence long before most people had assimilated these into their everyday life. The band delved into the oft-sullied waters of the `concept’ album, whilst most of their contemporaries were still struggling with the notion of the four-minute song ! Their astounding musical prowess, restless intellectual awareness and keen sense of futuristic perspective has always kept them several steps ahead of most modern bands. And the band’s success has been largely in earning the respect and acknowledgement of their peers. Now, in 1995, perhaps the musical world is at last catching up with the touch of uniqueness that best describes this band. 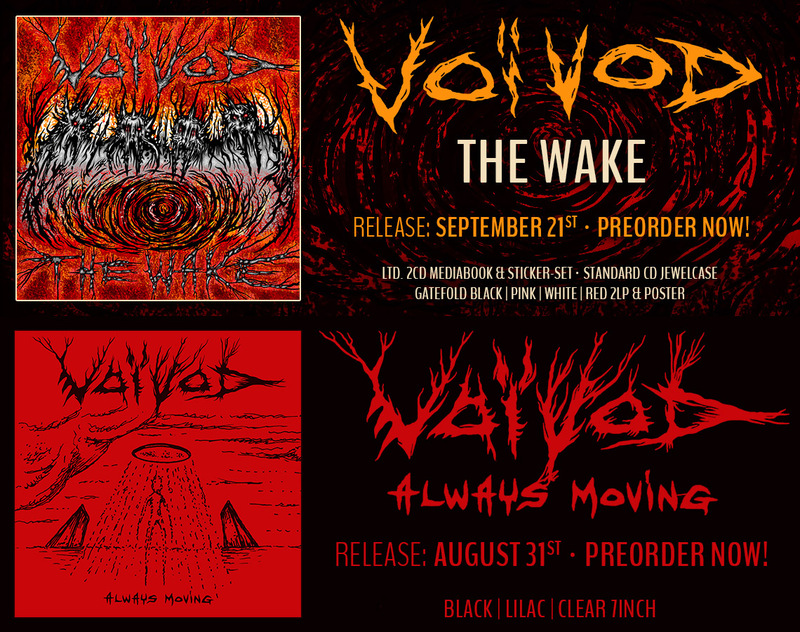 Maybe at long last, Voivod will earn the commercial success their critical acclaim has long since demanded. 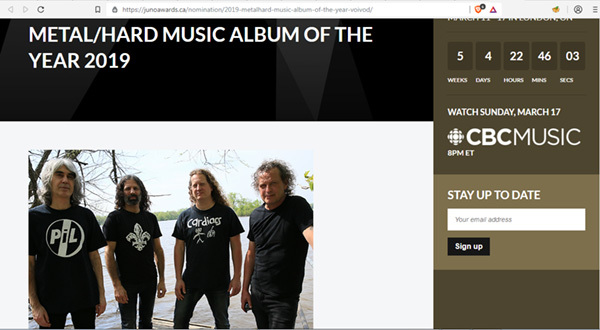 On their eighth album, `Negatron’, the founding duo of Michel Langevin (drums) and Denis d’Amour (guitar) are joined by new bassist/vocalist Eric Forrest, who was previously with unknown Canadian act Liquid Indian. “When (vocalist) Denis Belanger left, we decided that what we really needed was a bassist who could sing,” explains Michel. “We really wanted to go for a power-trio approach. Anyway, our manager saw Eric with Liquid Indian in a Toronto club. And he thought he was the guy for us”. 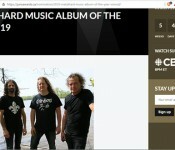 The result was that Forrest took a train to Montreal… and jammed on old Voivod material with Michel and Denis. On `Negatron’ (for the scientifically-minded, a negatron is a sub-atomic particle of the same mass and charge as the more well- known electron), the band worked in Hypnotic Studios in Toronto, in the process creating a raw, energetic album reminiscent of their late `80’s classic `Killing Technology’. We wanted a record that sounded live and powerful and we’ve got exactly that ! We co-produced the album with the resident engineers at Hypnotic, and did the whole record very quickly. The European version of the album features 11 tracks which showcase lyricist Michel’s diverse interests, ranging from the infamous conspiracy theory that governments on Earth are secretly allowing citizens to be abducted by aliens in exchange for technological knowledge (check out songs called `Project X’ and `Cosmic Conspiracy’), to the notion of an uncontrollable race of superhumans (`Nanoman’). There are contributions on the record from two major outside artists. Jim `Foetus’ Thirlwell wrote the lyrics for `D.N.A.’, and also sings on the track (Michel went to Thirlwell’s Brooklyn studio to record his vocals on a Dat machine, mixing down the result at Hypnotic), whilst former Men Without Hats singer Ivan Doroschuk helped out with the lyrics for `Nanoman’. As `Negatron’ proves, Voivod are still right to the fore of modern Rock music, breaking down barriers and exploring new worlds, civilisations. Boldly going where no musician has gone before. “I must admit that I did think about giving up Voivod and concentrating on computer animation as a career (Michel used his computer expertise to create the mechanical ant image that appears on the sleeve of the album, working with the Soft Image program devised for the dinosaurs that made such an impact in `Jurassic Park’. This image is also to be found on the first video from the album, for the song `Insect’). But then I went to see Soundgarden, Sepultura and The Ramones play live in a two- week period – and they all dedicated songs to Voivod. It made me think again about giving all of this up. Voivod – a band with a distinguished past speeding irresistably into the future.